Without Steven Spielberg, Chucky might not be slashing away today in not only an upcoming reboot from MGM, but his own future TV show and a planned 8th movie in the current ongoing horror series. Not to mention his awesome cameo in Spielberg's own Ready Player One. Yes, at one point in the recent past, Spielberg had a hand in saving the killer doll and the Child's Play franchise. Child's Play hit theater screens way backing 1988, and horror fans were instantly fascinated with the possessed doll Chucky. He was initiated into the slasher club and stood tall next to Jason Voorhees, Freddy Krueger, Micheal Myers and Lesterface. The franchise has stretched on for seven movies, with Cult of Chucky premiering just last year. And Chucky hasn't undergone a remake. But that's happening now. Audiences are still hungry for this horror series which has always been as funny as it is scary. Even though it's had a long and rich history, the Child's Play franchise almost stalled out after that initial movie. This is where Steven Spielberg steps in. Franchise producer David Kirschner explains what happened. "They immediately ordered a second film because it had done so well and was received so well. We were in pre-production and getting everything ready, and I'm on a plane to Cincinnati when Richard Burger (head of production for MGM and United Artists) called. 'There's a guy by the name of Christopher Skase at Quintex, they're buying the company and don't want to make horror movies,' he said. I was enraged." ""Steven said, 'Look, you made your first film with Universal, just give them your wish list of what you want and I would have done my job in giving them the first crack at it. I owe my career to him and that's still the case today, I went back to them and said, 'Because of Steven, we're bringing it to you first,' and they met almost all of the demands. That's how we got into the relationship with Universal when five other studios were bidding on it." Universal has released all the sequels through Cult of Chucky and there are plans for Child's Play 8, along with the upcoming TV show that brings back the entire current team. The remake, interestingly enough, is happening over at MGM, where the first movie was produced. While MGM didn't want anything to do with Chucky after that first movie, the studio now hopes they can launch a successful rebooted horror franchise from the well known title. But since the old incarnation of the series lives on, they are doing some tweaking to make his new version their own. 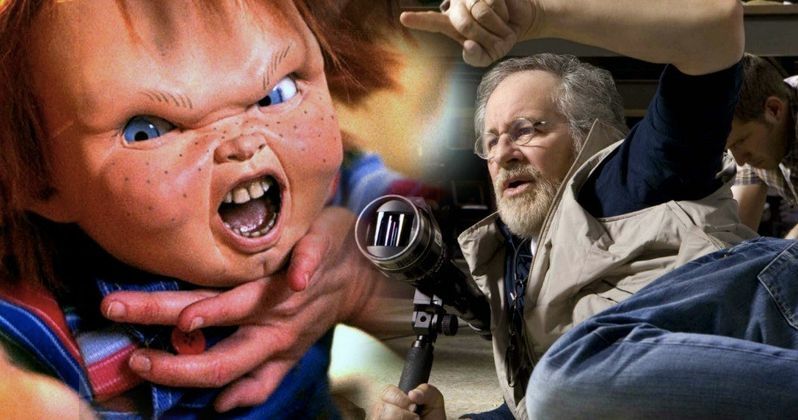 Steven Spielberg was able to celebrate his long history with Chucky by including him in a key sequence during this March's Ready Player One. When we'll see Chucky on the big screen next is a little foggy, but the doll will continue to live on in infamy. Bloody Disgusting first reported this news.